We’ve covered several Stormforce systems this year; all of which have proven themselves to be good value for money with great cable management and support to boot. Today we look at something a little more up-market, rocking a £1,999.99 price tag. The Stormforce Crystal GTX 1080Ti features a, you guessed it, NVIDIA GeForce GTX 1080Ti, the fastest graphics card NVIDIA offered in the 10th generation of their GPUs. The 1080Ti sports 3584 CUDA cores and 11GB of GDDR5X memory to give some of the best performance available on the market today. Alongside that is an AMD Ryzen 7 2700X with 8 cores and 16 threads to power through all of the demanding tasks you can throw at it. We also find four memory DIMMs from HyperX, totalling 32GB and rated at 2400MHz, a 240GB SSD and 2TB HDD; the hard disk drive is configured as a storage drive, giving ample room for movies, music and games, while the 240GB SSD presents speed and an overall snappy operating system. 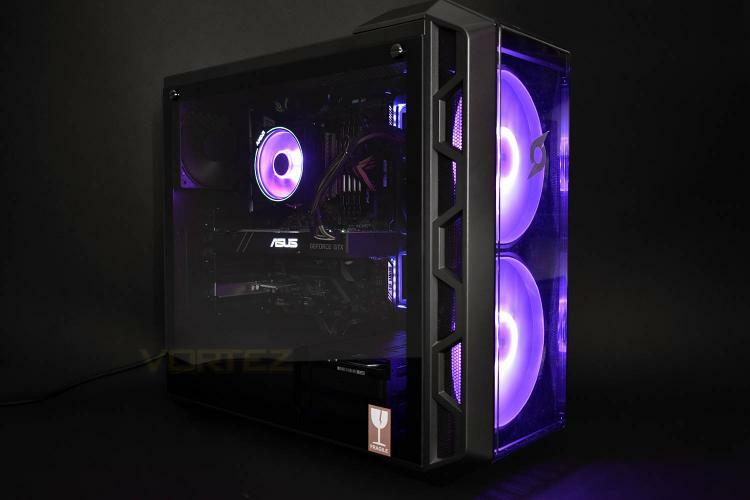 Cooler Master provide the H500 chassis to encapsulate all of the components, helping to keep things cool and quiet with two 200mm RGB fans on the front and a tempered glass panel on the side to show off the internal RGB lighting. Protecting the mentioned above is a 3-year collect and return warranty for added peace of mind, but the main question is: how does it perform? Due to the NVIDIA GeForce GTX 1080Ti, we’ll be sure to test this at 1080p, 1440p and 2160p. Introducing the “Crystal Ryzen 7 2700X GTX 1080Ti” based on the very latest cutting edge AMD Zen architecture. Equipped with an AMD Ryzen 7 2700X running up to a lightning 4.30GHz, offering powerful octa core performance combined with the mighty AMD B450 chipset. A huge 32GB of DDR4 RAM runs at a swift 2400MHZ, delivering blindingly quick multitasking performance.